The first test between India and SriLanka was a dissappointment not just because of three-and-a-half days of heavy downpour, but also because the Indian team-management got bogged down under pressure to include former captain Saurav Ganguly in the line-up. It was clear that public pressure had alot to do with this inclusion, as many cricket-lovers in India are avid supporters of the once dashing left-hander. Over the years, his game has fallen from grace quite spectacularly. For one of the leading one-day scorers in the game, Ganguly's apparent nervousness at the crease in recent times is just very sad. He needed more time outside international cricket then he got. He needed more time to play at a consistently high level before being re-inducted into the test roster. You guys wishing Ganguly's ouster are all living in a fool's paradise. Ganguly is to Team India what sugar is to milk. Indispensable. Reliable. and Dependable (sorry Rahul). He is the only Australian in Team India. If India is to really win the World Cup it needs a strong charismatic leader, who can inspire and sacrifice for his team, not a "gentlemanly" Hijra like Dravid. Rahul does not know the taste of blood, he is a veggie. 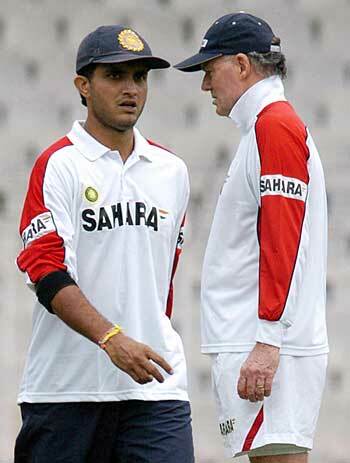 Ganguly is, so reinstate him as captain before it is too late. I'm not too sure what you mean by "you guys". Anyways I don't want to get bothered by that. Ganguly has been a stalwart in Indian cricket but whenever I see him bat these days, I do feel he's totally forgotten the art. My point was that Yuvraj deserved that spot more then Ganguly. I honestly haven't seen any batsman struggle during a lean patch as much as Ganguly has. Sorry boss but he's only there because "certain" sections of fans have put alot of pressure on team-management. He's not there due to merit. I think the only reason why I see Ganguly in the side is because of pressure from Bengal and Kolkattans in particular . And , looking into Dravids performance and matches he has won , I think he needs to be applauded while Tendulkar I believe(apart from his recent Century) seems to be long gone from charisma . He's Finished . Now its Dravids Era now . Yeah, Dravid and Sehwag I would say.